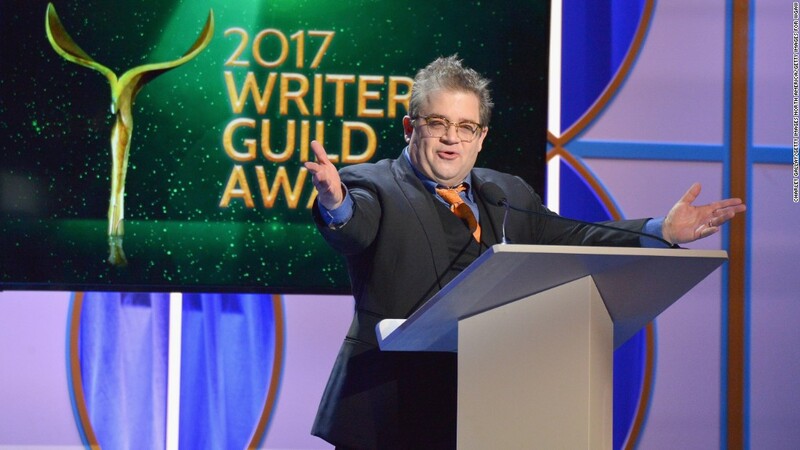 (CNN) A few of the honorees at the Writers Guild of America Awards had strong words for President Donald Trump on Sunday night. The award show — one of the last stops on the Hollywood praise train known as award season — gave out honors to “Moonlight,” “Arrival,” “The Americans” and “Atlanta.” But it was also notable for the defiant speeches from honorees, including Oliver Stone and Aaron Sorkin. “Donald Trump taking Obama’s job would be like if the head of linguistics at Rutgers made fun of David Lee Roth, and David Lee Roth was like, ‘I’m gonna take his job,'” Oswalt joked, as he mimicked a hit song from the 80’s icon. The gag continued all night, with the two uniformed men standing on stage as the evening’s honorees accepted their awards. Sorkin, who was awarded the Paddy Chayefsky Laurel Award for Television Writing Achievement, quipped that it should come as “no surprise” that he had comments of a political nature to make while accepting his statue. “We’ve been told that as coastal elites that we’re something less than real Americans and out of touch. If you find it mind-boggling that living and working in the two largest cities in America make you less than a real American, you are not the one who’s out of touch,” he said. Sorkin went on to lambast Trump’s travel ban, his claims about illegal voting (of which the president has not provided evidence) and his criticism of mainstream media. “If you don’t think that turning away people who are seeking a safe haven, from unspeakable brutality, is a morally defensible idea, then you’re not the one who is less than a real American,” said Sorkin. Stone was honored with the WGA West’s Laurel Award for Screenwriting Achievement. Stone is a veteran of the Vietnam War. “Try to find not what the crowd wants so you can be successful, but try instead to find the true inner meaning of your life here on Earth and never give up on your heart and your struggle for peace, decency and telling the truth,” he said. Neither President Trump nor White House Press Secretary Sean Spicer had addressed the criticisms on Twitter as of Monday morning. The White House did not respond to CNN’s request for comment.